Activits campaigning against policy brutality and racial profiling have reached Washington DC, having marched more than 200 miles from New York City on foot. They have planned a rally for Tuesday on the west lawn of the United States Capitol Building. Demonstrators departed from New York, NY on April 13 and spent a week trekking 250 miles down the East Coast before arriving at the nation’s capital on Monday. They plan to speak out against police brutality and racial profiling near the steps of Congress. On Saturday, the activists stopped along the way in Baltimore, Maryland and joined a protest there intended to draw attention to the recent death of Freddie Gray. The 27-year-old black man died over the weekend as a result of spinal injuries suffered days earlier while allegedly in police custody. Waves of other recent officer-involved incidents have resulted in fatalities across the US, with Gray’s death once again raising concerns about police tactics used against African-Americans. “We March2Justice for Black men and women, including transgender and non-conforming individuals, the incarcerated, undocumented people and all others in the margins and intersections who are all disproportionately impacted by police violence and systemic racism,” the group says on its website. 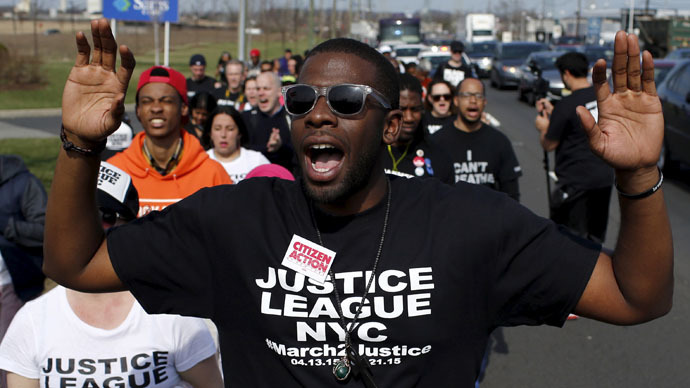 "I commend and firmly stand behind The Gathering For Justice, Justice League NYC and the partner organizations responsible for the March2Justice," actor and humanitarian Danny Glover said in a statement published by the rally’s organizers. "The time is now for action-based initiatives to supersede wishful thinking, and collectively, their decades of experience in building more conscious communities is inspiring." The march officially began last Monday in Staten Island where Eric Garner died in July 2014 after being placed in a chokehold by an officer with the New York Police Department. One month later, 18-year-old Michael Brown died after being shot in broad daylight by an officer in Ferguson, Missouri. In both instances, neither man was armed. While in DC, the March2Justice movement plans on lobbying Congress for a “Justice Package” of proposed legislation that would install a new federal program for delinquent youths, curb racial profiling and remove militarized weaponry from local law enforcement groups.